Better Buy: The Home Depot, Inc. vs. Target, Inc.
A comparison of two of the largest retailers in the country. With retail's earnings season now upon us, this is an excellent time to compare two of the biggest heavyweights in the industry -- Home Depot, Inc. (NYSE:HD) and Target, Inc. (NYSE:TGT). In recent years, Home Depot has been one of the best-performing stocks in retail, riding a bullish wave in the building materials and home improvement sector. Target, on the other hand, has confronted many of the problems plaguing other brick-and-mortar retailers, such as the rise of Amazon.com and e-commerce and concerns that the country is "overstored." 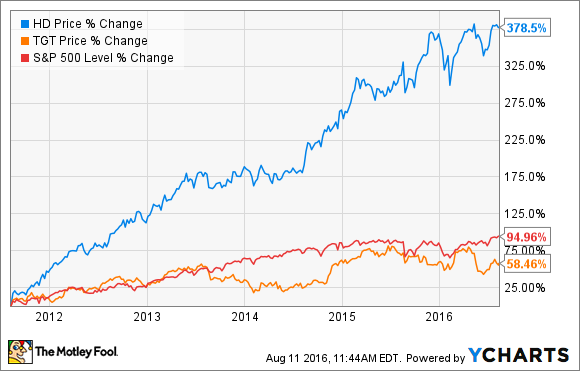 As the chart below shows, Home Depot has been the clear winner over the past five years. However, past performance is not an indicator of future results, as they say. Let's take a look what each of these companies has to offer investors today. Unlike most retailers, Home Depot has also resisted opening new stores in recent years, choosing instead to add new services to current locations, invest in its e-commerce platform, and buy back stock. Home Depot has essentially the same store count it did 2008, at 2,274, when the housing crisis was in full force. While Home Depot's same-store sales growth has been consistently strong recently, Target's growth has been more muted, with the company growing 2.1% last year and 2.3% in the first quarter of 2016. The retailer has suffered from poor management decisions in the past, including entering Canada, which it pulled out of in 2015 at a cost of $5.4 billion. The company also allowed Amazon to run its website for 10 years until 2011, a misguided partnership that gave its rival crucial data and left Target with a late start in building its own e-commerce platform. Since Brian Cornell became CEO in 2014, the company has refocused itself, pulling out of Canada, doubling down on e-commerce with a $25 free-shipping minimum, and leaning on "signature" segments, which includes baby, children, design and style, and wellness. The strategy is key for Target to distinguish itself from an increasingly competitive field, especially with Amazon's rapid growth, and Wal-Mart's efforts to spruce up its stores with higher wages and other investments. That strategy has paid off, as comparable sales grew triple the companywide metric in the company's most recent report. Profit growth, meanwhile, was solid, as adjusted EPS increased just 11% last year. Target appears to be on track with its new strategy under Cornell -- the company delivered e-commerce growth above 25% last year. The stock is also nearly twice as cheap as Home Depot's on a P/E basis, as Target trades at a P/E of less than 14. Still, Home Depot has the much better track record of the two, and a clear plan to deliver earnings growth. Though a slowdown in the housing sector would present a setback to the company, Target still seems to face more challenges. While both companies have what it takes to beat the market in the coming years, Home Depot is the better bet of the two.